I’m teaching a class next month for flower painting with watercolor and pen and ink. I’ve been using this technique for about 35 years now so I might have learned a thing or two about the subject. A few of the pens that I used in the most recent test. Top to bottom, India ink and a #4 quill dip pen, my favorite Platinum Carbon Ink pen, a Uniball Vision Elite, Lamy Safari, Shaeffer calligraphy, and a brush pen with ink. In preparation for the class, I dragged out all of the accumulated pens that I’ve used over the years. I first started with the old fashioned dip pens and India ink. This is still a tried and true favorite. 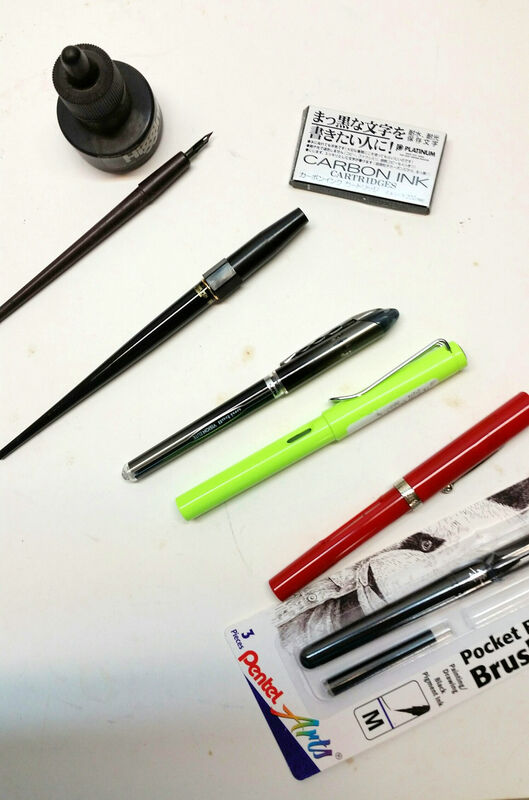 I use a #4 quill and used to buy them by the dozen as I tend to wear them down. (Or a #102 crow quill.) I like the feel of the quill pen and the slight variance of the lines as I draw. However, there’s often the problem of an errant drop of ink on the paper, which, being India ink, cannot be removed and is difficult to cover up. Also, when I was doing house portraits and using a ruler for some straight lines, the ink would sometimes wick under the ruler, again, spoiling the painting. Several years ago, I began exploring other pens. I’ve tried many of the mechanical drawing pens but they were too difficult to clean. Some commercial pens were nice but the ink faded over time. I’ve actually done some tests in the south-facing window of my studio and some of the inks faded totally away! My current favorite is the Platinum Carbon ink pen. These are wonderful pens with cartridges, never seem to clog, and are very affordable. 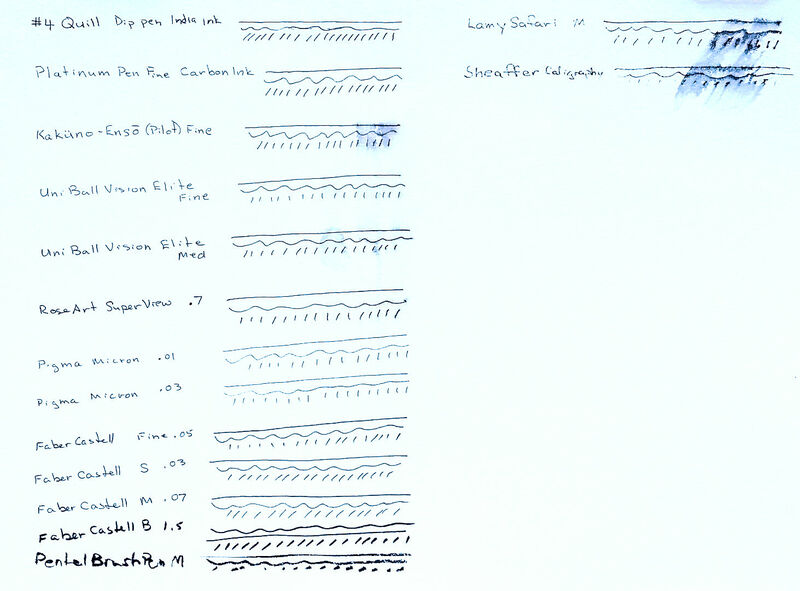 Several others that I tested in this sample are the Lamy Safari, Faber Castell, a brush pen, and whatever else I had. Samples of various pens and inks. The blurred samples are where I dragged a brush loaded with clear water to test the fastness of the ink. As you can see, they’re not all the same. After drawing the test sections, I let them dry completely, and then passed a brush with clear water over the lines. As you can see, some of the inks are not waterproof at all. This could be a problem for artists who do the ink drawing first before they add the watercolor. In my case, it wouldn’t matter too much as I always start with a quick pencil sketch, paint the watercolor, then add the details loosely with the pen and ink. This test paper has been in my window for 16 years. On the inside of this piece, I tested several commercially available pens as well as the standard India ink. Some faded totally away while some others held up surprisingly well. Anyway, if you’re interested in the class, there are still some openings but it’s filling quickly Here is the link for the signup. Flower Painting Class. search my blog for more posts about using pen and ink. 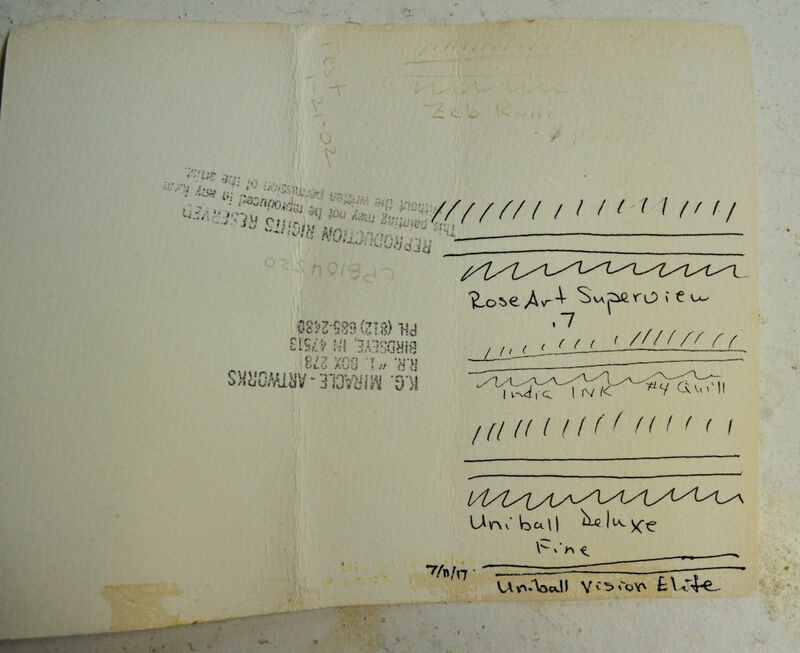 This entry was posted in art, painting instruction, pen and ink and tagged art, kit miracle, painting instruction, pen and ink. Bookmark the permalink.